KOKOMO, Ind. — Robert "Bob" Hayes Sr. is the recipient of Indiana University Kokomo Alumni Association (IUKAA)'s Distinguished Service Award, honoring his dedication to his campus and community. 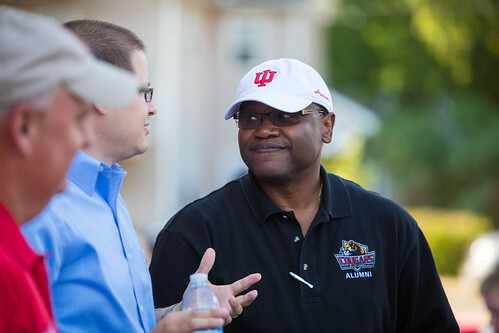 Bob Hayes at the IU Kokomo Volleyball Tailgate, 2013. "I am so very proud of IU Kokomo and where it is going, and I am grateful to have had some small part in its evolution," Hayes said. "I am positive IU Kokomo has more to offer, and is growing to meet the needs of central Indiana. I encourage anyone thinking of getting a degree, or who has a child ready for the next step after high school to make IU Kokomo their first choice." When he learned he would receive the award, he asked to have the May 29 recognition dinner at the Carver Community Center, another organization that has impacted his life. Proceeds from the event will benefit the educational and recreational center. "It's an easy decision to give back to the Carver Community Center when I have the opportunity," he said. "It has played a defining role in my life, since I first attended in kindergarten. Many of us came from single parent homes, with no male role models at home, so the leaders there filled the void. Without the center, I would not be the person I am today." Judy Golikto, IUKAA president, said Hayes has been a role model of community leadership to herself and other IU Kokomo alumni. "Bob has a wonderful way in which he provides service to the campus, that also enhances the city of Kokomo and this region," she said. "He is an excellent ambassador for us, and a most worthy recipient of the Distinguished Service Award." He was a major supporter of the campus partnership with the city and Kokomo Center Schools to obtain the Cougar Gym located downtown. Hayes earned a Bachelor of General Studies degree from IU Kokomo in 1995. He has been president of the IUKAA executive alumni board of directors, and a member of the Board of Managers of the IU Alumni Association, where he was involved in decisions that affect all the regional campuses. He also is an at-large member of the Kokomo Common Council, and is immediate past president of the Carver Community Center Board of Directors. "He is a hard working IU Kokomo alumni, dedicated to advancing IU, IU Kokomo, and his community," Golitko said. The Distinguished Service Award dinner will take place at 6 p.m. on Thursday, May 29, at the Carver Community Center, 1030 N. Purdum St., Kokomo. Tickets are $30 each, and may be purchased at iuk.edu/alumni/DSA. The IUKA also will recognize recipients of its $750 scholarships for 2014. Honorees include Ashley Lowe, Twelve Mile; Abigail Pinkston, Galveston; Hannah Randall, Kokomo; Julia Walters, Bunker Hill; and Ann Yebei, Kokomo.